On the 9th September on a cool morning 6 of us met 12 kilometres south of West Wyalong on the Newell Hwy at Charcoal Tank Nature Reserve. Charcoal Tank Nature Reserve is 86.4 hectares in size and was originally established as a Travelling Stock and Camping Reserve on 9 August 1911, and established as a Public Watering Place on 8 November 1911. In 1960 it was proclaimed as ‘Charcoal Tank Wildlife Refuge No. 2’ and the land was dedicated as ‘The Charcoal Tank Nature Reserve No. 46’ under section 9(1) of the Fauna Protection Act 1948 on 6 May 1966. We all met at 8:30 and after an hour and a half in the car it was decided that a cup of tea was required. While we did this the first three birds made their appearance. Once we had finished our morning tea we headed off, planning to walk to the north east corner of the reserve and then walk down the dry water way that travels diagonally to the south west corner. We found the first of the three dams that are along this waterway but I led everybody up a wrong gully and we found ourselves at the fence line on the northern side so we headed back south looking for the water course, we missed it again so had to head back the other way. Missing the waterway was not that bad a thing as in this part of the reserve we picked up around 10 birds for the list and walked in and out of both the Mugga Iron Bark/Grey Box/Cypress Pine Woodland and areas of Broom Bush/Mallee Shrubland. 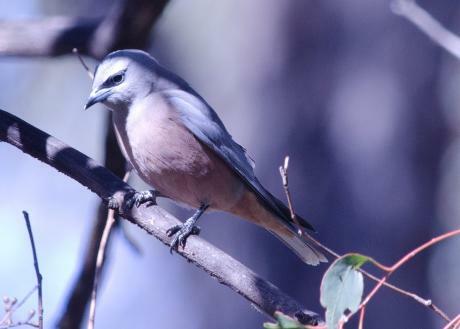 While we were finding our way back to the waterway we came across a flock of feeding White-browed Woodswallows. This was a new bird for some in the group so we spent some time watching these and noticing the difference between the males and females. It was interesting to note that while we were looking at the Woodswallows there were no other birds so maybe they had pushed everything else out of the area that they were feeding in. After we had finished watching the Woodswallows we found our way back to the water way and continued along its course until we could see the fence at the south western corner. When the food and discussion was finished we said our farewells happy with the bird list even if we didn't get any of the mallee birds that we had hoped to see and content with having spent a day in the bush with good company having seen a vegetation community that we hadn't seen before.